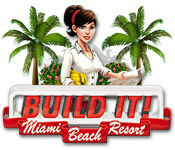 Build your own beach resort! Begin in the 1920s with simple bungalows and reach unbelievable heights. Each level is a new year: wonderful art-deco hotels, the invention of the cinema, the first fast-food diner and –decades later – giant hotels right on the beach. 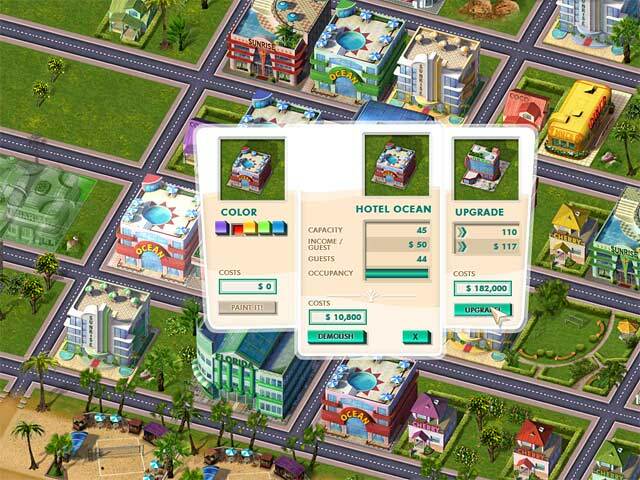 Cash in on renting out your hotel rooms, while shops, restaurants and other leisure facilities bring you leasing receipts in this fun Time Management game. Build It! Miami Beach Resort is rated 2.9 out of 5 by 10. Rated 5 out of 5 by Jeana_Lowes from One of my favourites Another Sims style game (old school Nintendo / Playstation city scape game, I mean, not new life emulating style games). There are a plethora of options to build, upgrade, and challenges amongst the goal oriented / campaign style gaming that keep it from getting old. Rated 5 out of 5 by Bwgirl from One of the older games I keep going back to! There are several of the older games that I continue to download over and over again (every time I get a new computer or a newer hard drive) just because they are challenging and fun. This is one of them! You won't find mindless repetition. You really have to work at making this work out. Which is pretty cool. Unlike the Build-A-Lot games where you have set places to build your buildings and you try to reach the time requirement, this game gives you plenty of leeway to hang yourself if you make the wrong choices, LOL! Rated 5 out of 5 by goldenhands55 from Excellent TM Game I've played a lot of TM games and this is the first time that I've ever wanted to write a review. If you're into the mindless endless clicking building games, this one isn't for you. However, if you want a challenging game that makes you think (a lot) you need to try this one out. I've always looked for a progressive building game. Going to a different screen every level and clicking over and over for the same tasks bores me. This game solves that issue. Some of the Finding the balance each level is looking for is the key. Keep checking the graph icon at the bottom of the mini-map. Rated 5 out of 5 by GYPSY42075 from Fun game! This game was one of the best games i have played in years I enjoyed it very much it pleased me well too! I hope that there could be more games like this so I am my cousins could play this thanks again for creating this game and have a Lovely Day! Rated 3 out of 5 by jgfsuzu from A game for teenagers. My overall rating for this game is 3.5. Not bad at all. Rated 2 out of 5 by msmelbautista from It was ok but.... This game was ok at the start but as you go along the progress of the game, I found it conflicting. Some of the tasks were repetitive. You always have to keep your population and leisure in check otherwise, you'll get stuck. I found the building permits very irritating. Wish they had like an endless game where you could be as you wish without any tasks. Rated 1 out of 5 by oOBluebelleOo from Annoying, frustrating game! I concur with other people who found they couldn't move forward as soon as the tutorial was over. Basically, I was spoon-fed through the tutorial right down to being told what colour to paint some of the buildings in the task list & then I failed the very next level after the tutorial because I had (& I'm paraphrasing here) 'painted myself into a corner'. The 'advisor' suggested I restart the decade (meaning in this case the entire game) from the beginning. Well, how how can you get that stuck, that fast when you're only building on what you achieved in previous levels & the bulk of what you've created so far is at the behest of the tutorial?! There's effectively not one but two sets of criteria you have to satisfy to beat the level. One is fulfilling the task list, the other is 'the bottom line' or stats list (not sure what it's really called). Only problem is completing the goals in the task list effectively scuppers any chance of balancing 'the bottom line'. I'd used up all my housing permits, so I tried demolishing smaller buildings for something bigger in order to attract enough guests. When that didn't work, I tried raising 'attractiveness', only to find the necessary properties were all greyed out. Moving onto other levels & earning helpful bonuses that you can use on earlier levels isn't allowed in this game - fail the level & you're stuck 'till you beat it. There's a 'hint button' which I used copiously throughout the one hour trial & doing everything it said didn't help one bit! After re-playing the level four times over I had a go at 'replaying the decade' - except it wouldn't let me. I had to come right out of the game & start from scratch. So then I tried clicking 'menu' & reading 'how to play' & that was as utterly opaque as the wretched tutorial! Next I handed it over to my husband to see if he could shed any light. Unfortunately, the hour ran out while he was still working through the tutorial. 'Inscrutable mess' is definitely the word for it. 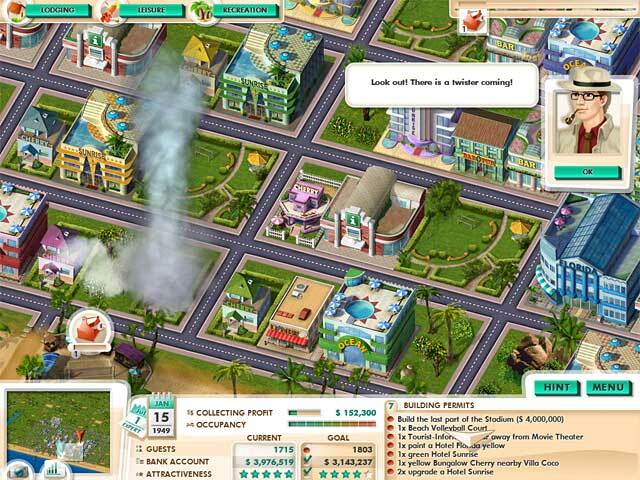 Treat this game with the contempt it deserves & try such fun, relaxing resource management/building games as My Tribe or Many Years Ago or the sublime & highly amusing time management/building game Coconut Queen, instead. Rated 1 out of 5 by eluvre from If you want a migraine, this game is for you. My expectations were pretty high for this game. But, the game became one of the most frustrating games I ever played. I wasted almost an hour of my time playing three years-- repeating 1923 four times and still wound up on the losing side. All of this left me undone. The longer I played the game, the more confusing it became. Do yourself a favor and pass on playing this game. 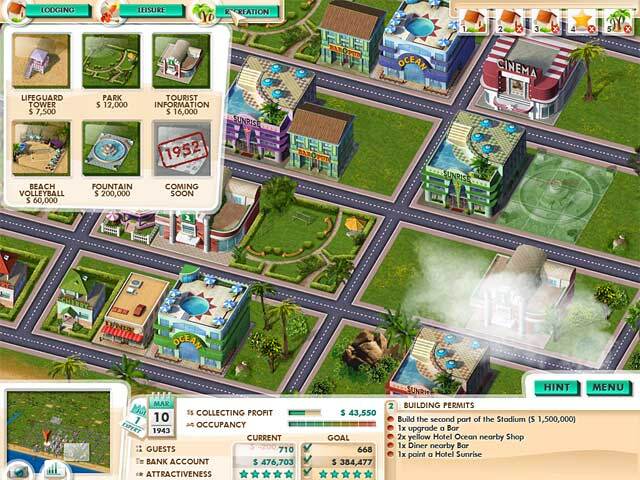 This game is nowhere near Build-A-Lot, Be Rich, Plan it Green or Green City... its a headache. Rated 1 out of 5 by VJean23 from Bad instructions This game is not user friendly. I found it difficult to find how to keep balance between lodging requirements and leisure. Just not as fun as Build a lot games or the Be Rich series. Rated 1 out of 5 by DrDavid from Wasted time I played three levels (years) with two being full tutorial and the third ending with no result. The first two levels ended and I had no idea what I had done right or wrong and the third level told me to build recreation but all were greyed out. I also built a hotel with no building permit. How? I don’t understand. This was too stupid to continue. I exited the game and deleted it after half an hour. Don’t waste your time trying to figure out this inscrutable mess.